Recently my eldest turned 9. He greeted his birthday with the usual youthful enthusiasm of a child who knows he is about to be showered with presents. After receiving his gifts and having his special pancakes with chocolate topping breakfast I took him off to his Saturday soccer match. He was delighted to be playing his favourite position of goalie for the first half. A perfect soccer birthday present. This statistic pretty well made me gasp. Given that these first 9 years have effortlessly slid by, I’ve suddenly got a glimpse of how quickly my son’s childhood will be over. But it’s not over yet. And we are determined to continue to make his childhood a tapestry of rich memories threaded together by strong and meaningful relationships. By the birthday bonfire later that evening, I reflected on the first half a childhood my boy has experienced and what it’s been like mothering the first half of his childhood. The moment that little man was born and I held him in my arms, I was enveloped in a vacuum of love. The feeling of him in my arms was like no other. The vacuum of love in those moments after his birth were thick. There was nothing else in life that mattered in those moments apart from absorbing and transmitting sudden deep emotions. As I held him for the first time and the thickshake of emotions swirled around, I vaguely became aware of the midwife gasping, “Oh dear, he’s poo’d all over Mummy.” I didn’t respond, but I can remember feeling annoyed that she would distract my attention from this bundle that I was completely besotted with. Poo is inconsequential when your life is being transformed. Becoming a mother is a transformation. You are still yourself, but never again the same as before. I realised later why she would make a comment, the poo was rather enormous, and black and sticky and was plastered all down the front of my hospital gown. I didn’t realise at that moment how the poo was symbolic of what was in store for me in the years that followed. Lots and lots of poo. But let’s not dwell on the drawbacks of motherhood. The first moments of my son’s life. Since those first moments of motherhood, every moment afterwards has been guided by love for my child. Of course the intensity of that initial fierce rush of emotions subsided, but never the amount of love I have for that boy. And so his childhood began. My days were devoted to giving him a childhood that would set him up for life. The effects of a good or a bad childhood echo throughout the rest of a person’s life. The enormous responsibility of parenting can be a daunting task if you let it be. So instead I started by focussing on learning one thing at a time and then doing each thing I knew to the best of my ability. Of course, I often failed. But gradually we traversed through the fields of childhood. Jonty loved his wooden bee mobile. Onwards he strolled through the meadows of discovery. Crawling becomes a vehicle to venture further and to make more exciting findings. First stop is normally the Tupperware cupboard, but so many places to go from there. Learning to walk is increased the pace. The ability to walk through the meadow of discovery and pick bouquets of adventure and excitement naturally only increased the thirst for further exploration and before long he was running. I have many, many fond memories of childhood. Becoming a mother has made me more aware of the time in childhood that a person cannot actually remember of themselves. The baby and toddler years are precious years of passion. Feelings are immediately expressed and hysterical giggles can morph into hysterical tears in a moment. Everything is a related to feelings and discovery. And I learned that as a mother, you are most likely the person who most treasures the moments and experiences of what will become their forgotten years. Childhood amnesia is a part of every persons life. Grey misty memories of early ages can be obtained, but those who loved you most keep most of the moments close to their heart, and even if the stories are not all told, it adds a layer of complexity and beauty in that rich tapestry of love that surrounds a person. Batman in hiding. Undercover in a hedge. 0.5 of childhood. The halfway point of riding bikes, climbing trees and jumping on the trampoline for hours. A time when little regard is given for time. There is no realisation that time is in fact fleeting. He has swam through the summer days and played hard during winter in the frosty outdoors with little regard to the cold. (“Please son, put a jacket on! I don’t care if you aren’t cold. I’m cold, so that means you have to put one on.”) Disregard for dirt and cleanliness and any food that features sprinkles is classified as gourmet. Childhood is when the journey of education begins. When Mummy blinks back the tears as her little boy skips into Kindy and then plunges into school life. Childhood. A time when life is taken for granted. Because that is the way it should be during this time. Too many childhoods have been ruined by selfish adults and by wickedness thrust upon a child’s innocence. My child trundles through childhood unaware that he is lucky. Unaware that there are dangers that others experience, but not him. Of course there are times when he has a glimpse of his own fortunate life. I can remember my boy staring at a picture of a little African boy. Skin clinging to ribs with nothing in between. Stark bareness all around. As he looked at the picture he peppered me with questions about where and why and then he sat staring at the picture, for at least half an hour. And then he began dreaming. Scheming of ways to help the helpless. In his imagination planes full of food and necessities were flying endlessly. Houses shipped across oceans. Inventions to find water. Machines to create happiness in far off villages. All impractical and childish, but visionaries only need a seed and the seed doesn’t need to be practical. Plant the seed, let it grow and practicalities will come in time. In the end all the dreams were reduced to a small donation from one little boy’s money box. As he grows, so does his awareness of the outside world increase. The second half of Jonty’s childhood will not be the same as the first half of his childhood. During the second half of the year we will continue to water that seed of awareness of those around him and those who live differently to him in the world. Early childhood is by nature egotistical. He is becoming less self centred but compassion for others can also be learned, so it is our goal to continue to foster that in him as he grows into adulthood. It is my ambition that by his teens he will be able to focus energies outwardly rather than filling the status quo of a self centred teen. We have started to share memories. He is no longer dependent on my memories to remember his own life. And so a major part of our role as parents is assisting the creation of memories. Giving our childhood experiences and learning opportunities that will later become the memories that shape their life. Giving them experiences that they are able to learn from and grow from. Not all memories necessarily need to be pleasant, but the main thing is that from the trials of life they grow to be a better person from it. So on that 9th birthday, as we reached the halfway mark of childhood, the memory creation continued as children danced around the fire, twirling with glow sticks, making up games and hunting for more wood to throw on the pile. Hollering, whooping, no fear of darkness but pure childhood heaven. 9 years old, but still plenty of time for firsts. On that night it was the first time they ate smores and then later settled down, after watching a movie for his first sleepover with a mate. His cousins also slept over, but that wasn’t a first. All deposited in the good memory bank while blood ties and friendship bonds that keeps growing richer. One of the greatest joys of motherhood is that I have become a childhood bliss creator. The currency of my payment is smiles and giggles, whoops of excitement and jumps up and down in ecstasy and anticipation. Childhood. It’s a long term investment. A healthy happy childhood will keep paying dividends for a lifetime. What do you think are some of the delights and highlights of childhood? On Tuesday morning, he bounced down the hallway with an enormous smile on his face. When he saw me, the smile only got wider and he started jumping up and down on the spot. It was his first day of school. My little boy was ready to start school, so ready. I gave him a cuddle, exclaimed loudly how exciting it was that it was school day and scolded him for growing up. I keep telling the kids that they need to stay little. They always ignore me. He giggled and puffed out his chest proud of the fact that he was now such a big boy. He declared that today all his dreams were going to come true. He was going to big school! He proudly dressed himself in his uniform and went to grab his bag to leave. “Hang on”, he said, and ran into the bathroom, stood on a little stool and gazed at his reflection. “Yep,” he declared, nodding. “Just right”. Then he picked up his bag and scampered out the door and into the car. His big brother followed, a little more reluctantly. School isn’t his favourite thing in life. “But it’s OK Mum,” Jonty said, “I’m kind of looking forward to going back to school now. I want to play with Noah and Corinne every day again.” Social life is the most important aspect of school after all. Despite his easy transition from Kindy to Big School, there still is an adjustment period for little ones to get used to school life. Jonty also is having a period of adjustment from holiday mode back into school mode. Here are some tips to help your child get back into a school routine or adjust to full time schooling. Serving your child the right type of food will aid concentration, maintain stamina and increase alertness. Make sure your child starts the day with a healthy breakfast. My boys particularly love oats. Trent normally cooks his own porridge. He needs help getting the quantities and turning on the stove, but he will sit stirring it until it is ready. Jonty is a big fan of raw muesli. Jonty summed up why it is so good for them to eat a slow release food such as oats yesterday when he told me, “I like eating muesli better than cereal now because when I ate cereal I used to get hungry before morning tea, and then I would be sitting in class thinking, ‘When is morning tea?’ But now I don’t even think about it and we have break time, and I eat and I’m not hungry again until lunch.” It’s not vanity to admit when he said that I was giving myself an inner high five, is it? 2. Ask questions about their day. Be interested. Who did you play with today? What was your favourite thing you did today? What did you do in (subject) today? Did you find something tricky at school today? How did you fail today? Did your teacher do something funny today? Who is kind in your class? Talking about your child’s day sometimes isn’t easy, I find they are not always forthcoming with answers. I find around the dinner table at night Alex and I always ask each child something specific about their day. Besides getting to know what your child does while away from you, being interested in their day communicates buckets to your child that you care about them and what they do. It is also setting yourself up for a lifetime of communication with your child. Trent had half days at school this week to ease. (He cried when he found out he needed to leave at lunchtime.) On Thursday we went to his old Kindy and he delivered her a letter and showed her what he looked like in his new uniform. Oh my, this was such a special moment. It brought tears to my eyes, and to his Kindy teacher! It was also nice to give the Kindy teacher and aide feedback on how he adjusted to big school. I know the Kindy spends so much time preparing them for big school, it was so nice to report back that their hard work had been worthwhile. You should have seen the size of both of their faces when they heard Trent’s tale that the teacher said that Trent and a former Kindy friend had been the best listeners that day. There were High Fives all around! The adults all beamed with pride as Trent explained how he learned the “b” sound chuckled as he seriously told his Kindy teacher that, perhaps when she become a Prep teacher when she grew up. I love it how children often categorise their Kindy teacher’s as one of their own. On Trent’s last day of Kindy last year with his teacher. 4. Get to Bed early! To be truthful, my problem here wasn’t getting the children to bed. The greater challenge was encouraging the boys to go to sleep once they were in their rooms! Having a good night’s sleep will greatly assist your child to be alert and engaged in learning the next day. Set an early bedtime, particularly for younger children during the beginning of school. They use large reservoirs of energy during their school day, well rested children often will achieve more during their school day. You want to set them up to succeed! 5. Start establishing a morning and afternoon routine. Routine is so important for children. It gives them stability and predictability. When a child is secure and knows what is expected of him/her and when, it eliminates worry and helps them to focus on end results instead of worrying too much about process. In the mornings, set your routine up so their is a breakfast routine. Teach your child to be responsible for packing the bag with everything necessary for the day. If you wish your child to do any chores before school, also establish this routine now during the start of the school year. In our house the children are expected to Make their bed, tidy their rooms and clean their teeth in addition to packing their bag and getting dressed. I generally do not get them to do too much more in the mornings, because it is always my goal for children to exit the home as calm as possible. Extra jobs would increase the morning rush for us, but may work for other families. It may take a few weeks for you to work out the perfect routine for your family. Each year this plan will most likely need tweaking. Some parents find they need to let their child play immediately after school, others plunge straight into homework and other activities and then the children can have uninterrupted play for the rest of the afternoon. Your kids do a lot at school. Make it easy for them to have R&R after school and on the weekend, especially in these first weeks back at school. We are making sure that the pace of our weekend enables the children to recover from their first week back. So even though we are socialising, it will be laid back and low stress. I also limit after school activity. Normally I only allow for one extra-curricular activity per week. I knew this would be too much for Trent though, and pulled him out of after school activities until March when his little body may not get as exhausted from learning new routines. Both boys were mentally and emotionally exhausted by the end of this week. I’m so relieved they only had a four day week to begin! It is common for a child to have little emotionally break downs during the first week of school. Be patient and understanding with them. It takes a lot of energy to be well behaved at school all day, recognise that little meltdowns when your child gets home is also because he or she feels emotionally safe not to hold the tension in anymore. Of course you need to teach your child to be respectful still, but allow them to release their pent up emotion. Give them lots of cuddles and reassure them that they are doing well and it’s OK to feel overwhelmed, but give them strategies to overcome any problems they might be worrying about. Giving your child a chance for physical release is an excellent way to assist an emotional child. Giving time in the backyard to play or kick a ball, stopping at a park on the way home or packing swimmers and dropping in at the local pool might help curb the temper and let them release energy through play and activity. Did you have children starting school this week? Any first timers? What strategies have implemented to help the transition from holiday mode back into school routine? Children are naturally selfish creatures. For the most part. Mine most certainly are. It’s always lovely to find stories that allows children to identify selfish behaviour and provide a springboard for parents to discuss selfish behaviour and encourage kindness and consideration for others. We have been having these discussions in our house lately and there have been three books that the children have not only enjoyed, but have also allowed us to talk through important life issues with. (Although at the moment it’s priced at $15.00 if you can find a school or centre with a scholastic book club to support.) 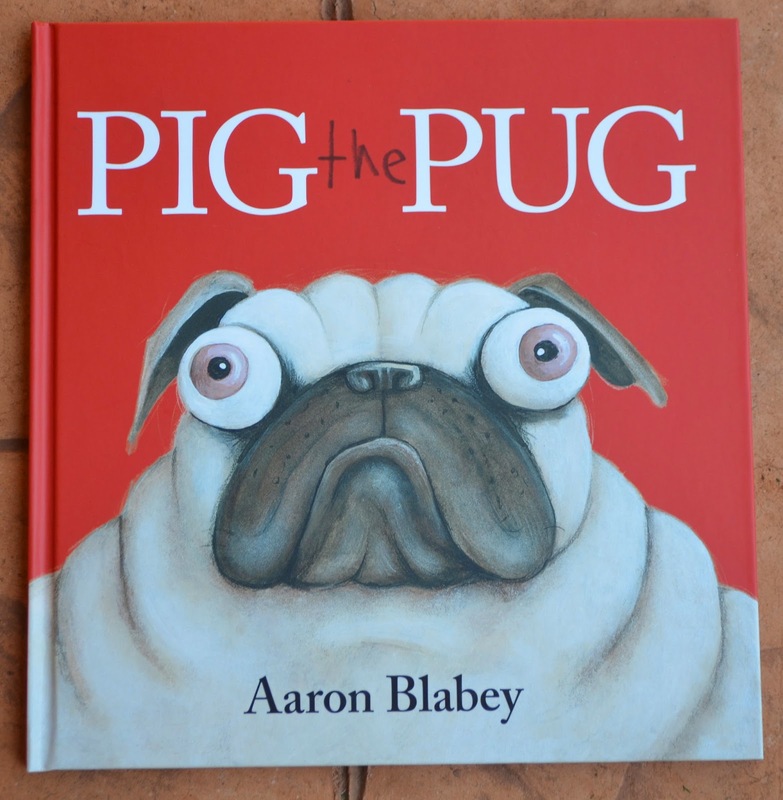 Also, Scholastic has a Pig the Pug Colouring-In Competition if you have a child who likes to colour! Pig is a pug dog who is greedy and selfish in most every way. He lives in an apartments with a sausage dog named Trevor. Trev seems like a very amiable guy, unlike Pug who flips his wig over the thought of sharing toys, piling the toys up to deny any access. Unfortunately in his efforts to keeping the toys as MINE, Pig fall out the window, which is unfortunate because, “Well, pigs cannot fly.” My favourite line in the book, which unfortunately the children don’t ‘get’. I think my 8 year old now understands with a long winded explanation. So, unfortunately Pig was a pug that had to learn his lessons the hard way. Why it bad to not share your toys? How can you share your toys nicely with others, even if you don’t want to? Why was Trevor still nice to Pug? Do bad things happen to people when they don’t share? What nice things happen when you share? Another clever book that examines selfishness is King Pig by Nick Bland. (Scholastic Press, June 2013, RRP. $24.99, but you can find it in the current Wombat Scholastic book club for $12.50) King Pig is King over a flock of sheep. He literally walks all over them. Although the long suffering sheep comply to King Pig’s demands, King Pig is disgruntled. They don’t adore him. King Pig sets about to make the sheep adore him, to no avail. Finally, after a gentle challenge to try being nice, King Pig feels something he’s never felt before, he felt sorry. After this revelation he tries to make amends, which wasn’t perfect, but the sheep agreed it was a pretty good start. This was a hilarious read, and in true Nick Bland style, the illustrations were brilliant and captivating. Why did the sheep complain? What type of things can we do to make people smile? Was King Pig a bully? Why? Do bullies always realise that they are being bullies? How do you think about other people’s feelings rather then just your own? If we have nice things, and others do not, how should we treat others? Can you force people to like you? What makes people like you? Boa’s Bad Birthday by Jeanne Willis and Tony Ross was released in June and is a Koala Book from Scholastic Australia, with a RRP of $14.99. It turned out that it was Boa’s worst birthday ever, all his gifts were rubbish. In time he discovered that dung beetle’s gift turned out to unexpectedly be the best gift ever. Which is why you should always thank people for gifts that stink, because you never know if it’s going to turn out to be a really great gift! the morals that the story presented quite thoroughly. I’m afraid my children have been known to be ungrateful on the odd occasion after receiving presents they didn’t appreciate. We have often tried to talk about gratefulness and not being selfish prior to gifts being given before, but I don’t think the message has ever been delivered as effectively as it was when accompanied by this story. What would you say if you were Boa and you got those gifts? Why did Boa still say nice things to his friends even though he didn’t like their gifts? Do you think it was good that Boa didn’t tell his friends when he was feeling angry and frustrated? Do you think his friends like Boa? Why? Do people have to give you presents? What did Boa’s friends do wrong when they brought him a present? What do you need to think about when you give someone a present? Have you ever had a present that you didn’t like at first but then found out later that it was a really great present? What are some things you can say to people when they give you a present? Do people have to give you a present at all? Without a doubt, this book is going to be a family classic. I will be putting it aside and re-reading it before birthdays, probably for many years. I highly recommend it if you have a child who struggles with being grateful for unwanted gifts. It’s also nice to build up the excitement prior to a birthday. As I wrote in my post. Jonty didn’t get many toys this year. When he opened presents, he was very gracious and grateful for what he received. I was so proud! 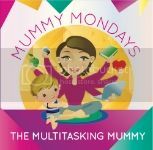 Today I’m linking up with Eva at the Multi Tasking Mummy. * Scholastic gifted me with these books. All opinions are genuine and my own. It was my son’s birthday last week. Birthdays are so exciting when you are a child. It is one of my great delights in motherhood making birthdays special for the children so that they will be some of the golden memories etched into the memoir of childhood. I find having the particular date gives me focus and ambition – kind of like a due date. I’m the type of person that needs the due date in order to do the work. Give me an open ended assignment and I cannot guarantee it will be achieved. I had a bit of trouble this year trying to decide what to buy Jonty for his birthday. He has so many toys, and even though he plays with them constantly and is not the type of kid to neglect his toys, he really doesn’t need any more. In the end, we decided to give him an experience. We have promised him a trip to Australia Zoo to celebrate his 8th year with his family. We’re happy with the concept that it is a present to be enjoyed as a whole family, it encourages a sense of community rather then being focussed on self and fosters a feeling of belonging. We will make it special for him by paying extra for him to have an animal encounter. (Although one of the cheaper animals, although it would have been nice if we had a few hundred dollars spare to let him pat a tiger.) He will also be in charge of deciding the itinerary for the day and all decisions will be deferred to him. Unfortunately he is going to have to wait until September when soccer season is over before we do the trip to the Sunshine Coast for this special day, so we had a few gifts of a DVD, CD’s and his first ‘real’ Bible. The kids gave him an Iron Man toy also. This year Jonty had a Pizza Party. Strictly it was not a party. The Accountant was very clear about this. However, Jonty disregarded his father’s restrictions with the secure knowledge that extended family always celebrate one another’s birthdays. He also knew that this meant his five cousins would be showing up. Party. Right there. He also knows that his mother is amiable when it comes to inviting people around, so he politely asked months in advance if his best friend could come around on his birthday. Which I agree to. Fully knowing that because of the nature of the “Not Party” affair I would invite his best friend’s whole family and not the child alone. (As a side note, it is most convenient when your children befriend your friend’s children. This is the first year I have known Jonty’s friend’s family, and it makes life so much easier!) Once again knowing that I am a soft touch, he also requested that his kids church leaders come and since they are an absolutely awesome young married couple who have established a great relationship with Jonty and Trent. Let’s just say that encouraging solid role models in my children’s life is worth cooking an extra pizza for. So, before we knew it with aunts, uncles, grandparents, cousins, child friend plus sibling and grown up friends we had clocked up 12 kids and 15 adults invited to his 8th Birthday celebration. (Not Party!) The Accountant is not known for his culinary ability, except for making Pizza. In this family, pizza making is a Daddy domain. Last month after hearing the children declare that “Mummy can’t cook pizza”, I determined to show them that of course I could cook pizza. Thanks to an expired batch of expired yeast my efforts were sabotaged and Daddy still wears the golden pizza crown. And so, Daddy was requested to make pizza for the crowd. The Accountant and I were up until late the night before getting everything ready so that when we returned from church we would have as little to do as possible. The Accountant made all the bases and loaded the pizzas, I did the chopping. It was actually a really nice evening chatting away to one another as we did this. After arriving home from church the next day, The Accountant made some more pizza dough up so that the children could roll their dough and create their own pizzas. This was a great activity for the children and they were really excited and loaded it with veggies they may not have eaten if anyone else had put it on their pizza. It did also create a bit of a late lunch because the kids pizzas went in the oven first, so it took quite some time before there was enough room to start cooking the pizzas for the adults. One small girl watching her pizza being cooked. The best thing about being a “Not Party” was that I didn’t need to worry about party games, the kids just disappeared outside and were happy playing in the yard for hours. (Truthfully, the most stressful thing I find about children’s parties are the children who demand entertainment and structure.) In fact I had a bowl full of lollies for the kids, that I didn’t put out for them, they were just so busy that it didn’t happen. For those familiar with the Australian classic, the original Woman’s Weekly Party Cakes book, Jonty chose the jelly pool out of that. In my children’s cake making career, (now spanning 7 years starting at Jonty’s first birthday), I have never completely followed a picture of any one cake. This year it was no different. When I was trying to think what figures to put swimming in the pool, I came up with the idea of having Lego characters. I bought a small box with a shark, jet ski and surfer, and ended up coming up with the idea of doing a beach rather then a pool. Jonty didn’t care whether it was a beach or a pool, just so long it had chocolate biscuits on the side and jelly in the middle! The shadow is a kids hand, this is the only photo I could get without a kids hand in it. They kept on pointing and trying to touch. Very popular cake! So voila! A beach cake, blue icing on the outside since the ocean doesn’t have edges like a pool, crushed up biscuit for the sand and Lego characters drifting around or lounging on sour strap towels. It was a little hard to take a photo of the cake unfortunately. Normally I would take a photo when I finished icing it, but because this cake wasn’t finished until I put the jelly in just before serving, I had a crowd of children around the cake while we tried to take some pictures. I must say, jelly with cake is a huge hit with the kids! See, look at the hands. They just couldn’t help themselves! I am linking up with Essentially Jess for I Blog On Tuesday. We have just returned from a holiday at Grandma’s beach house in Bundaberg. On the way home from the beach one day, I was so incredibly proud of you. 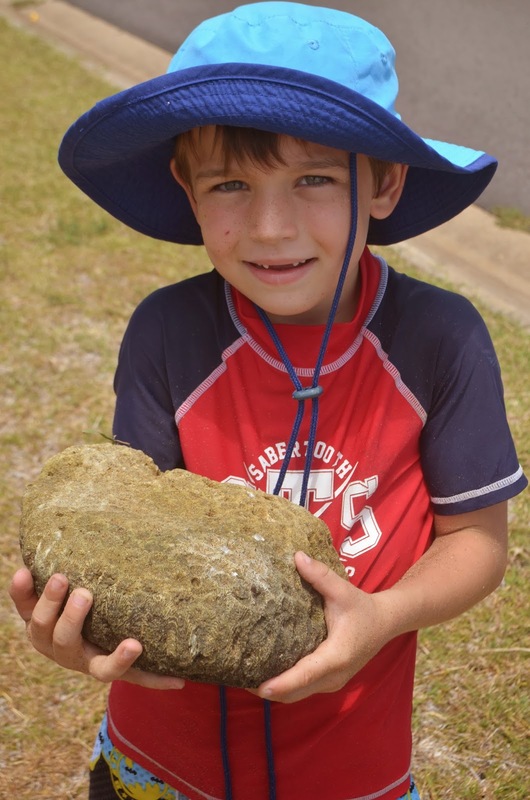 After you and Trent rode your bikes and Mum and Dad pushed the triplets in strollers, we had arrived at the beach and you discovered a rock that you really loved. Daddy and I did not understand why you loved it. It was bumpy and ugly and it was big. That beach is full of rocks. It was low tide, and we were walking around on the rocks discovering things like little fish and crabs. Of all the multitudes of rocks, this one took your fancy. You immediately communicated your affection for this particular rock to your father. You told him you wanted to bring it home. Your father clearly stated that he was not going to carry that rock home. You turned around and carted that heavy rock across the flat sand where the water had left the shore and left it near your bike. We played in the water, explored the shoreline and swam in the inlet. When we returned to the bikes and prams with five tired children, we had completely forgotten about the ordinary rock. You once again expressed your desire to bring the rock home. Your father once again stated his refusal to be a part of this plan. You knew there was no negotiation on this point. You simply picked up your bike and struggling with it, you made your way up through the soft sand holding, and pushing and slipping and straining. It was not long before we noticed the determination on your face and recognised that this was a project you were committed to completing. And you did. For about 500m you persisted, not complaining, resolute in achieving your goal. You tried a variety of methods, wrapping a towel around the rock, sitting it on the seat of the bike and at various points on the frame. At last you discovered that balancing the rock on the handlebars was the most effective way to transport the heavy rock and slowly you walked pushing the rock and using your body to balance it all. Even still, the rock kept becoming unstable and heavy and dropping. Your bike now has several extra scratches and dents. Daddy had walked ahead of you, pushing the double stroller with two tired cranky boys in it. Trent also needed to keep moving on his bike. But even still, they would pause, wait for you to catch up, speak some encouragement and keep moving. Imogen and I slowly walked with you, tripling the time of our journey home under the hot midday tropical sun. Encouraging you, suggesting new strategies, waiting as you struggled, keeping you company so you were not alone on your endeavour. Because my darling boy, we are your family. This is what will always do. We will walk beside you, support you and encourage you. We are your greatest fan club, your loudest cheerleaders. It would have been easy, my son, to have taken the rock from you and to have carried your burden. But if we had done that, we would have denied you the journey. We would have denied you the achievement and success that was yours at the conclusion of your project. We wanted you to use that fierce determination that you own and persevere and complete the task you had set yourself, even though it required personal sacrifice, dedication and effort. It is these character traits that will lead you onto bigger projects and see the outworking and fulfilment of your dreams. And as you domy boy,we will always be there. Watching, waiting, expectant and proud of you. So very proud of you. In the end, when we got close to the house, you left the rock in the park for awhile, went and took your bike home, then returned to bring the rock back. I watched you the whole time (except when I ran inside for the camera), you sometimes feel nervous doing things on your own. Daddy came and walked the last bit with you before finally holding it as you both crossed the road together. And there you were, triumphant at last! Never forget, we love and support you. You are destined for greatness Jonty. Learn your life lessons while you are young, do great things when you are older. And never, ever lose your tenacity. Use that strength to succeed in doing good. What life lessons have you observed a child learn lately that has made your heart swell with pride? Today I’m linking up with Essentially Jess for IBOT. Last week Jonty arrived home beside himself with excitement. His first wobbly tooth had fallen out. This event has been much anticipated. In fact about a year ago he declared that he “Wasn’t sure, but I think my tooth might be wobbly.” It certainly wasn’t wobbly, but the amount he played with it, hoping for a wiggle, I though it might become wiggly. He has had friends who have lost teeth for quite some time, but it has taken until the ripe old age of seven before any of his departed his own gums. Yesterday he came bounding out of the car after school jumping all over the place, excited that his tooth had fallen out! It had been wiggly for a week or so and he had been playing with it endlessly until it finally dropped out and he went and told the teacher who wrapped the precious little toothy in a bundle of tissue and sticky tape. Of course there was talk of the tooth fairy. Jonty knows that we are the mythical gift/money bearing creatures such as the Tooth Fairy, Santa Claus, Easter Bunny. I just have heard of children being so disappointed when they discovered that it was their parents, so I decided not to conceal it. Nevertheless, thanks to the imagination of childhood, he still gets swept away in the fantasy of the moment. I also find that when they are young, they still think they are real despite being told, but when they are around five, they begin to understand, but don’t mind, so long they still get all the benefits! I went and found one of those little momento boxes for a first tooth. Trent was given two when he was a baby – so I just allocated one to Jonty. I don’t know what I’ll do when the triplets start losing teeth! The next morning he came into our bedroom with a worried look on his face, as he walked in, I saw him clutching the little blue box and a feeling of deep remorse immediately hit me. I had forgotten about the tooth the previous night! Before he could say anything, I instantly said, “Oh Jonty, the Tooth Fairy forgot!” Instantly you could see the relief flood into his little face. I have never been more relieved that he already knew that I was the tooth fairy. I don’t think he would have handled the tooth rejection nearly as well. He then returned to our room holding the five dollar note – looking disappointed! I asked him if he were OK, and he said, “Yes, but I thought I might get $100.” Gulp. The reason I forgot was I was going to give him $5 – a note for his first tooth. After that I’m planning on gold coins. But I hesitated because I wondered if $5 was too much, meant to ask The Accountant, never did and promptly forgot. Of course, I didn’t hesitate to put $5 in the next morning, if it was too much, call it late fees. $100 though? I explained that the tooth fairy is nowhere near that rich, and he’s doing pretty well since the 20c/50c I used to get as a kid! He recovered pretty quickly and became very proud of his money although he is even more proud of his gappy smile. That gap is going to become bigger very soon as the other front tooth is very wobbly! I was shopping in my local Big W the other day and saw a discounted Scholastic book by Don Gardner. How could I resist this cute little story about a monkey wanting his two front teeth? Even better the book has a CD, so we are treated to two songs about missing teeth and a monkey’s redition of “All I Want For Christmas”. Don’t you just love it when you find a children’s book that perfectly suits what’s going on in their lives? Has your child ever experienced Tooth Fairy Fail? What’s the going rate of teeth at your house? Do you tell your children about who the real Tooth Fairy, Santa, Easter Bunny is? This morning I opened up facebook on my phone and saw a friend’s status. As I read it, I reflected that, for sure and certain, I’ve been there. (Ha! How naive for her to think that she is the epitome of an unorganised mother. Redirect attention to – moi!) In fact, I thought I had a vague recollection of sending my child to school in slightly damp clothes before. But, I took comfort in the fact that I had seen Jonty’s uniform hanging in the cupboard yesterday, so today we were organised. Once I’ve sent him off to school I thought I’d write some comment under that post. “What?” I said in utter disbelief. “It was hanging in your cupboard.” Then I scurried into his room to prove my point. Except I was incorrect. The uniform I had seen hanging in readiness did not include shorts on the coathanger. Thinking quickly I remembered I had hung two pairs of shorts on the clothes line last night at 10pm. Surely those little polyester shorts would have dried overnight. It will be fine. Except for the extremely heavy dew that seemed to settled this morning. The navy fabric was quite drenched. I handed them to my son sheepishly. “This won’t take long to dry out, Jonty.” I cajoled him, (not entirely convincing even myself.) “This fabric dries quite quickly. It will be kind of like wearing your boardshorts after you go swimming. It won’t take long and it will be dry.” He looked at me dubiously and then muttered, “I’ll just wear my trackpants.” and shuffled away. I felt awful, especially knowing that it was forecast to be a warm day. The Accountant hadn’t started yelling yet, he was obviously running late also. I chucked the shorts in the dryer on their own. They were quick drying fabric after all. Who knows? I walked out to the kitchen. The Accountant was standing in front of the toaster. “Your committed to your toast, aren’t you?” I remarked dryly. “Absolutely.” he replied with a smirk. 7 minutes late and he still couldn’t leave without jam on toast. I proceeded to ‘make’ Jonty’s lunch. It consisted of as many pre-packaged items as I could find. Can I say how proud I am that my son likes canned tuna? So convenient. “OK. I’ll try them.” he sighed. He slipped his track-pants off and slid the shorts on. “But they’re cold, and it’s wet around the waist.” I acknowledged defeat and handed him the trackpants. He seemed happy enough when I picked him up. There seemed no scarring from wearing trackpants, despite the fact that the rest of his class were clad in shorts. en a dream will just happen.” He launched into some fantastical story involving spaceships and missile launchers. I wondered during what school subject this daydream occurred. Then I had another round of guilt knowing he inherited the ability to day dream from yours truly. He will learn that the ability to daydream is a blessing and a curse. He kept chattering and shared about the wonderful dream he had ‘downloaded to his brain that day’, and how he couldn’t wait to go to sleep to dream it. I was just thankful that he wasn’t going to have nightmares wondering whether he would be clothed for school in the morning. My boy and I. In a dry school uniform. What catastrophes have you had in the getting ready for school rush? I am entered in the Circle of Moms Top 25 Multiple Moms contest. If you could spare a few extra moments, (it doesn’t take long, I promise!). Could you click on the link above, scroll down to Caitlin’s Happy Heart and press the pink heart to vote for us? Thank you very much! I’m a kindy Mum now! This momentous occassion came because Jonty is now a big kindy boy. My little boy is estatic that he finally big enough to go to kindy, and we are just about to finish his 3rd week. He was so excited the night before kindy that he couldn’t sleep. I was so worried he was going to be too tired and grumpy on his first day, but he did just fine. He came home saying he was happy, although he was slightly concerned I’d packed too much lunch for him. Whoops. Overzealous first time Kindy Mum. He was then so excited he couldn’t get to sleep because he had been to Kindy. When I went in to try and tickle his back and send him off to sleep, (normally works a charm), he spent a great deal of time telling me in detail the exploits of his day. I loved it. I dread the day when school will become boring and when I ask what he did during his day, the reply is “Nothing”. For now, I love all the little stories about building block bridges and playing in the sandpit and all the little things the teacher said. He’s certainly settled into his new routine. So much so that he tells me that he now does wees in the Kindy toilet. Slightly aghast, I asked why he hadn’t answered the call of nature earlier at Kindy. “I just didn’t want to miss out on any of the fun.” was his solemn reply. It’s good to know that he’s figured out that toilet breaks are a necessity. I’m very happy that the spare of clothes didn’t need to get used before he figured this out. Jonty’s cousin, Corinne the pocket rocket, (my sister’s mini clone), is also in the same class. Isn’t she adorable on her first day in her daggy red hat? Corinne has also settled into kindy life, and unlike the Jonty who doesn’t know anyones names, (Although he has mentioned that, “I’m worried about the twins.” Dramatic Sigh. “They are just too little to go to kindy. They shouldn’t come when the are too little. They should wait until they are big like me.”) The Pocket Rocket is on first name basis with the entire class. Has been condescending enough to speak to children who do not listen to her in an extremely loud voice, but has reassured the teacher that she will speak in a normal voice to Mrs. C since Mrs C. is a good listener. The Pocket Rocket is also on a quest to change the Kindy hours to suit her schedule better. She has informed Mrs. C. that the current times are not quite acceptable and has suggested a few changes to work in with her family life. Here’s the stars of my over zealous first time Kindy lunch. Made with love the night before. Jonty had picked out making mini-pizza’s for his first Kindy lunch from a cook book. I thought it would be fun to make them into funny faces. It was quite easy, and a great way to sneak in vegies. I packed two, which is how many he would normally eat at home, then threw in a 3rd, because he’s always hungry at the moment and asking for more. He ate one at Kindy, came home and ate one for afternoon tea, then fed one too the dog. Humph. The dog was the most enthusiastic about the lunch. The Baby had thought it was a pretty good package too when he ate his at lunch time. So, the start of Jonty’s education has started well, thanks to his outstanding teacher. Nothing more heartwarming as a parent to meet a teacher who adores hanging in the sand pit with your kid, gives your child warm enthusiastic welcomes, listens wholeheartedly and keeps the parents updated with all the little events throughout the day. The Accountant even admits its worth the kindy fees!